Photo courtesy of Ingenieria y Servicios de Montaña, S.A. 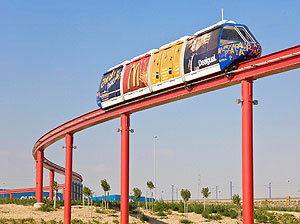 The Plaza Imperial Monorail is a short shuttle line that connects parking and shopping areas. While the distance is relatively short, it serves as an easy way for shoppers to cross a major thoroughfare. For more information and spectacular images, see the Plaza Imperial Monorail Photo Essay in our Special Features section.